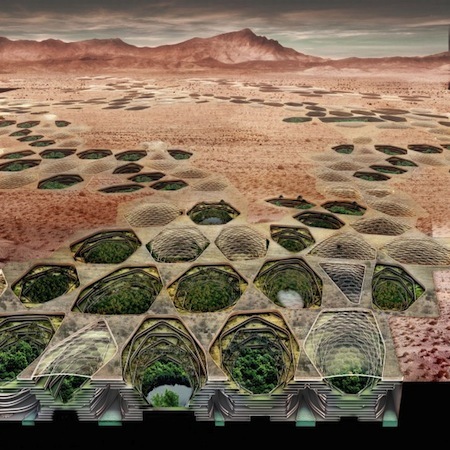 Sietch Nevada is a concept exhibited in Innovative technologies and climates at the University of Toronto. 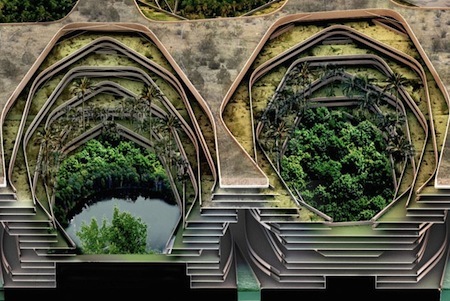 Fans of Frank Herbert's Dune will immediately recognize this proposal - to build semi-subterranean terraced geometries in the Nevada desert. "In Frank Herbert’s famous1965 novel Dune, he describes a planet that has undergone nearly complete desertification. Dune has been called the “first planetary ecology novel” and forecasts a dystopian world without water. The few remaining inhabitants have secluded themselves from their harsh environment in what could be called subterranean oasises. Far from idyllic, these havens, known as sietch, are essentially underground water storage banks. Water is wealth in this alternate reality. It is preciously conserved, rationed with strict authority, and secretly hidden and protected." "Sietch Nevada projects waterbanking as the fundamental factor in future urban infrastructure in the American Southwest. Sietch Nevada is an urban prototype that makes the storage, use, and collection of water essential to the form and performance of urban life. Inverting the stereotypical Southwest urban patterns of dispersed programs open to the sky, the Sietch is a dense, underground community. A network of storage canals is covered with undulating residential and commercial structures." I'm also fascinated by the warning in the final words describing the Sietch Nevada project: "Sietch [Nevada] is also a bunker-like fortress preparing for the inevitable wars over water in the region." Fremen: "Place of assembly in time of danger." Because the Fremen lived so long in peril, the term came by general usage to designate any cave warren inhabited by one of their tribal communities. 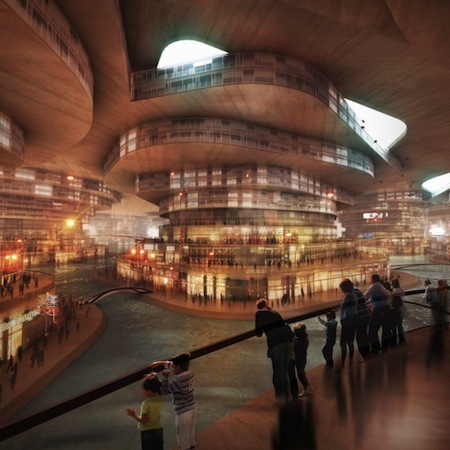 The Sietch Nevada project was created by Andrew Kudless (Design), Nenad Katic (Visualization), Tan Nguyen, Pia-Jacqlyn Malinis, Jafe Meltesen-Lee, Ben (Model). From Sietch Nevada via the always interesting BldgBlog. Also, don't miss the fifty other technologies and ideas from Dune (the most of any single book on Technovelgy.com).